If everyone isn't talking about cupcakes, then they're probably talking about that other "it" sweet treat—the classic French macaron. Over the past few years, I've noticed quite a few bakeries and patisseries that have popped up around the city, offering these delectable, delicate French confections. I appreciate a good macaron—crispy exterior, chewy interior, and light, fluffy buttercream or decadent ganache to pull all the flavours together. I've been missing my favourite macarons ever since Lemon Tree Patisserie went on an indefinite hiatus, so I thought this was as good a time as any to finally take on the first of my food goals I had set out for myself earlier this year. 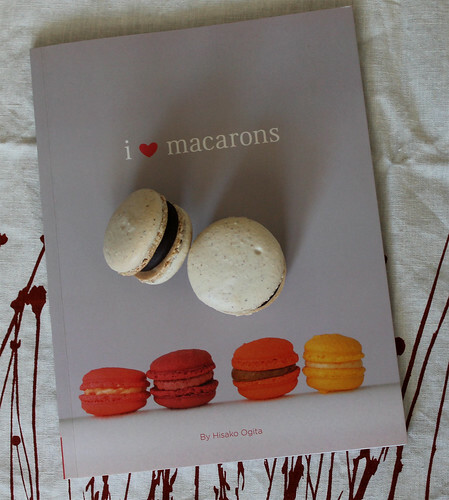 When some friends heard that I was going to delve into macaron-making, they lent me their copy of I Love Macarons by Hisako Ogita as a reference guide, a book I had seen quite a few times in bookstores in the past. I followed the recipe pretty much to a T, only making a minor change to my oven temperature as I thought the suggested temperature seemed a little too high for baking something as delicate as a macaron, and adding a bit of cream of tartar to the egg whites before beating as an added stabilizer. The results? Quite successful for my first time! I had expected, at the very least, to have my first tray come out of the oven with at least a few cracked tops, or macarons with no feet. 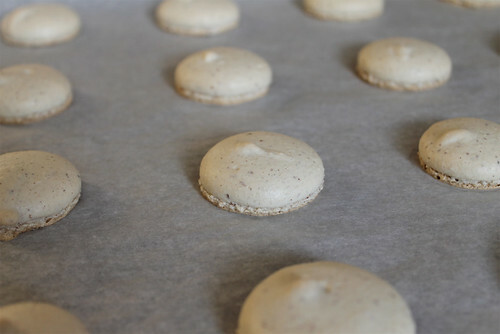 But halfway through the baking process, when I looked through my tiny oven window, I actually gave a little happy squeal when I saw the feet on the bottom of my macarons. Instead of blanched ground almonds, I used unblanched, which gave the macarons a rustic look thanks to the bits of almond skins flecked throughout the shells. Inspired by my friend Tonya's Cinnamon Macarons, I too decided to add a touch of cinnamon to the macaron shells and the chocolate ganache. I enjoyed my experience with making macarons so much I immediately went out to pick up my own copy of I Love Macarons. I love how clear and concise the instructions are, with the step-by-step photography to guide you through the process. Ogita simplifies what would otherwise have seemed like a daunting task to me. It's not as hard as I had thought it would be to make the macarons, but it does require a little bit of patience and precision. While I can't get my Lemon Tree macarons fix for now, making my own is a great (and easier-than-I-though) alternative. I can't wait to start playing around with different flavours and alternative recipes. 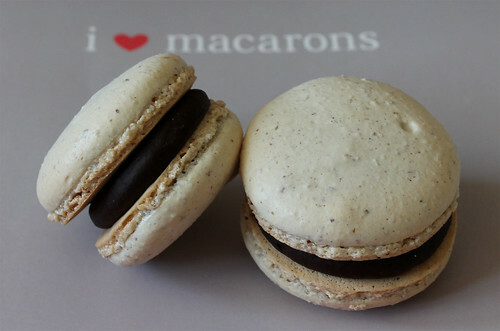 Have a favourite macaron recipe? Feel free to share it with me below! Brian Lew February 27, 2012 at 9:20 a.m.
Suzanne Ellis February 27, 2012 at 9:21 a.m. These were, in a word, divine. 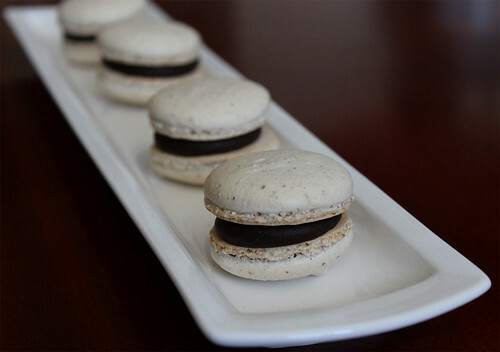 Crispy, light, delicately-spiced shell, and rich, decadent ganache filling. Thanks so much for sharing, B!! Andrew February 27, 2012 at 11:01 a.m.
"I actually gave a little happy squeal"... I laughed trying to picture that. :oP Glad to hear you've had another success in the kitchen! Anonymous February 27, 2012 at 12:50 p.m. I have that book! :) I can't believe you did such a great job on your first try.. I've attempted them so many times but haven't succeeded yet. I just got that book last week and haven't tried the recipes yet.. but hopefully when I do, mine will look as good as yours, lol. stephanie February 27, 2012 at 12:56 p.m. These look amazing! I can't wait to try making macarons for myself too! Mr Ron February 27, 2012 at 1:08 p.m. I'll have to add that book to my wish list now! Mardi @eatlivetravelwrite February 27, 2012 at 6:57 p.m. Amazing!!! So proud of you! Bonita March 4, 2012 at 9:18 p.m. Thanks for all the lovely comments everyone! Can't wait to bring you more macaron posts in the future!